Orange Oil and Limonene. Uses, Health Benefits, Side Effects. D-Limonene description. The use of Orange Oil has become a popular alternative to harsh and sometimes dangerous household cleaners, pesticides and solvents. Because of its safeness and effectiveness, it is now considered an excellent alternative to many cleaning products and toxic chemicals that are often used as pesticides. The rind of an orange fruit contains glands that produce the essential Orange Oil. During the production of orange juice, this oil becomes a by-product through either steam distillation or extraction. The extraction process begins after the harvesting of oranges. The oranges are shipped to a processing and packaging plant where they are steam distilled for the production of orange juice. 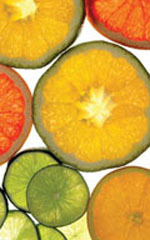 The essential oil of the Orange Oil is mainly composed of d-limonene that is extracted naturally from the orange rinds. Limonene is considered environmentally friendly and relatively safe, which makes it a good alternative to harsh and toxic chemicals. With its powerful antiseptic abilities, it is a highly effective cleaning product. It also contains solvent properties that are often used in many products such as stain removers, strippers and adhesives. Due to its pesticide properties, it is now being used as a safe alternative to toxic poisons that are often used by the pesticide industry. Limonene is also the source of the citrus fragrance, giving Orange Oil products their pleasant citrus aroma. Due to the safeness of Limonene, which is the major ingredient of Orange Oil, using Orange Oil around plants, people and animals is considered a better choice than potentially dangerous chemicals. Because of the many positive benefits of Orange Oil, it can be found in many building supply centers and retail stores as replacements for solvents, household cleaners and pesticides. Although Orange Oil is considered safe, it can cause mild skin irritation and may irritate the respiratory tract. Gloves should be worn as well as proper ventilation when using Orange Oil. These products should always be kept in a safe place away from children. They are considered safer than other synthetic and caustic chemicals, but Orange Oil can still be toxic and should never be ingested. Orange Oil products are also flammable. The essential oil from oranges offers many health benefits. To make at home the orange peels must be dried and then grinded. They are then placed in a mason jar and covered with grain alcohol. The jar should then be shaken vigorously for a couple of minutes and then shaken again in a couple of days. Using grain alcohol that has been warmed will help produce more orange oil. The mixture should then be drained through a coffee filter and poured into a shallow dish. Cover the dish using a cloth material to allow the mixture to breathe and evaporate the alcohol. Once this is completed, the remaining liquid will be the orange oil. When making your own orange oil, be sure to wear gloves and keep away from children and open flames. This also applies to the finished product, as orange oil is very corrosive and flammable. For cleaning uses, use a quart of water mixed with a quarter of an ounce of oil. Always test the oil before using on large areas. Read also about some citrus oils: lemon oil, lime oil and lemongrass oil. And other useful essential oils such as lavender oil and many uses in aromatherapy, jojoba oil and its incredible benefits, peppermint oil and its natural healing, grapeseed oil. A want to know more about your activities and products. what are your activities in the field of natural pesticides production?. Copyright © 2011-2019. Orange Oil. All Rights Reserved.